Lightweight, Ergonomic spring action snips. We all make mistakes and when we do reach for Famore EZ Stitch Snips. 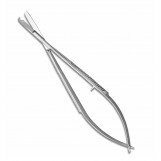 Our snips allow you to get under those tiny stitches for easy removal. Spring action allows both left handed and right handed people to use, and perfect for people with ailments that prevent them from using normal thread scissors. Smaller Size – perfect companion for on-the-go quilting/sewing bag. Fine tips – allow you to get under tight stitches. Can be Re-Sharpened – since we use a high quality German stainless steel. Eliminate those accidental snips of the fabric!